VeriDoc Global is a multinational technology company and provides anti-fraud document verification solutions using blockchain and smart contracts. These solutions ensure that a user is looking at a true and correct document created by the issuer. VeriDoc Global has developed an application to provide fast and cost-effective services with patented digital security and Quick Response (QR) Code technologies. Proof of original documents (as created by a document originator such as a bank, university or law firm) have typically been undertaken manually through sealing or certifying. These documents are presented in an original or certified format physically or through a digital copy when required for proof. A digital copy can be locked by various methods, however there is no way, using existing methods, to prove the digitised original has not been manipulated. These methods are therefore not 100% secure. VeriDoc Global has created a new process and solution to prove validity of an original document by providing access to a digital version of the original document in a 100% secure and tamperproof way. The trend towards a paperless office has grown rapidly, however, there is still a need for certain types of documents to be communicated in a physical form. For example, legal documents, government-issued certificates (such as birth certificates, driving licenses and passports), insurance documents, academic transcripts or property contracts, all need to remain in a physical form. Unfortunately, with advances in modern technology, these types of documents are open to manipulation through digital scanning, editing and printing. By way of example, a prospective employee may hold an academic transcript issued by a university - that transcript could be easily manipulated to display achievement beyond what was actually attained using software such as Photoshop, high resolution scanners and digital printing. When presenting the academic transcript, the employer has no way to confirm the validity of the document other than through university enquiries. 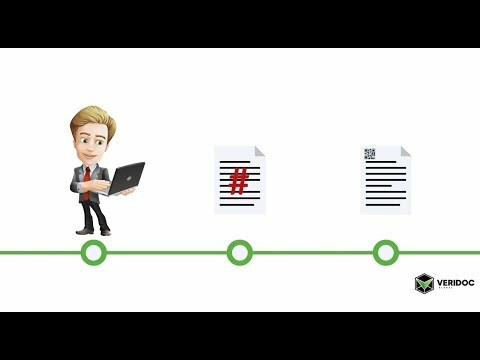 VeriDoc Global works with its customers, the document issuers and users, to embed a unique QR code into the original document. Using VeriDoc Global’s Certifying Algorithm, a unique hash value (the document’s DNA) is then generated for that document and stored within a blockchain. In the example above, the document containing a QR code is issued by the university to the student. An employer can then scan the document using any QR code reading app on a mobile device or computer. By visual inspection, the employer can then compare the untampered original with the paper document and easily identify any changes and confirm the validity of the document. MVP (Minimum Viable Product) launched. QR Code Reader App launched. Integrated with Ethereum Classic Testnet. VeriDoc Global approved as a registered UN supplier. VeriDoc Global Testnet Operating on Multichain. Integrated with Ethereum Classic Mainnet. VeriDoc GPS (Geo tags) launch. VeriDoc Track and Trace launch. VeriDoc Global Protocol on Multichain.